Today I'm sharing something personal--I have KP (keratosis pilaris). It's a common skin condition that causes rough, red patches that look like acne, but aren't. It's most commonly found on the back of arms or the top of the legs, but can be found in other places. It's not contagious and doesn't hurt. KP is not the same thing as eczema. It is caused by a buildup of excess keratin. It is common in dry skin. Sometimes it clears up on its own, and sometimes products are needed. 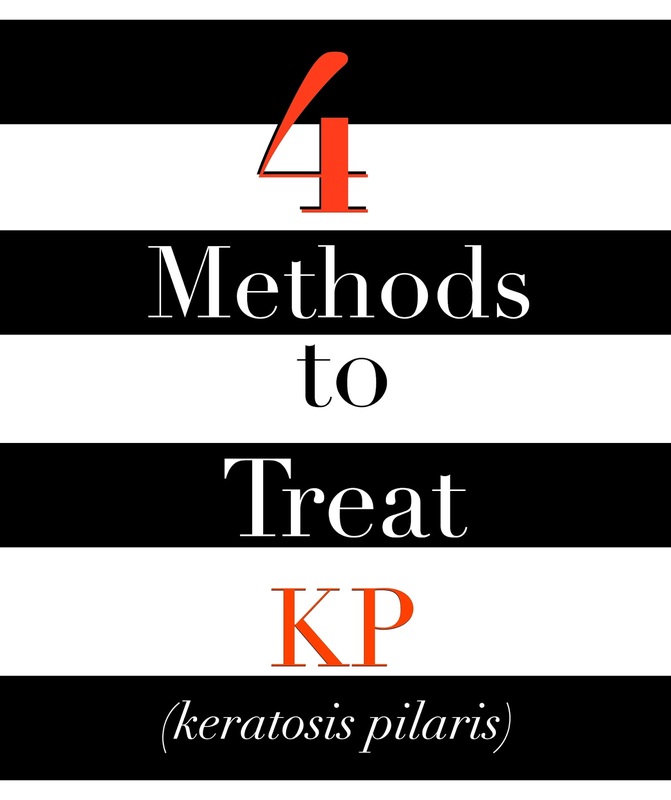 Today I'm sharing 4 methods to treat KP--all over the counter. Try these before heading to your Dr. or dermatologist. All of these have worked on others, and might work for you. Check with your Dr. if needed before beginning. 1-Prenatal Vitamins--These did nothing for me, but I have heard of these working for other women. If you get cystic acne, check with your Dr. first. Some hair/skin/nails vitamins have Biotin, which can cause some to break out. 2-Granule Exfoliation--Try using a salt or sugar scrub on the areas every time you shower. These can be purchased or made. Try my DIY section. I've got lots of recipes there. LUSH makes a great one (pictured). I prefer sugar scrubs. 3-Manual Exfoliation--I have tried brushes and gadgets, but nothing worked like these Italian Washcloths (pictured). They're actually Asian, they're cheap and come in fun colors, like red and green. I would also suggest Konjac Sponges. These are a really popular sponge for the face, but I like them on my arms. 4-Cream Exfoliation--I have tried oils, various lotions and potions, and thick creams with ingredients like AHA, lactic acid, or salicylic acid really work. I use these in conjunction with the washcloth. 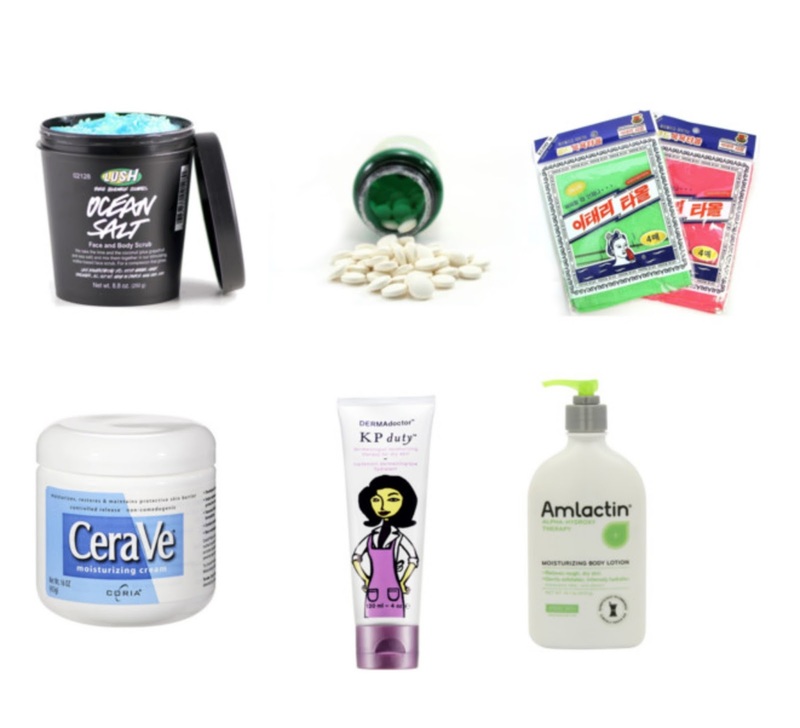 Some of my faves include CeraVe, KP Duty, Amlactin, and Curel Rough Skin Rescue. What else didn't work for me: coconut oil, dandruff shampoo, ingesting various oils, thin lotions. If I stop exfoliating and moisturizing, the roughness comes back. In the video above, I go into more detail about KP and these treatments. I also share some additional methods that didn't work at all for me. Thanks for checking it out! Hanging in there, y'all! Please be patient as I get caught up on emails and blogs. I'm trying to establish a normal life again and get over a cold. Again, thanks for your thoughts and prayers. I had a low-key weekend of watching Theory of Everything (it was ok) and finishing my audiobook of Not That Kind of Girl by Lena Dunham. She is a great writer, but her voice drove me crazy sometimes! OH my gosh yay! I needed this post. I also hope that you are doing okay! That LUSH Exfoliator sounds fab - also loving the color! I'm glad to hear that you're hanging in there, Elle. You/your family are in my prayers. I swear by Cerave products! There honestly is not a better moisturizer out there! I must really try Cerave (with the washcloth) ! I only read great things about it. Thanks as usual for sharing these tips. Still keeping you in my thoughts and prayers! Great tips. I don't have kp but I do get dry skin. I would guess it would be good for that too! I've tried Ocean Salt! Its such a great cleanser, but the sea salt irritates my skin a little. I don't have KP but I get super dry skin especially on my legs! I've been wanting to try that lush sea salt! This is an awesome post! I feel like I do get some of this on my legs sometimes so it's good to know some treatments for it! I never thought much about it but maybe I'll try some of the Exfolating methods! I hope your feel better and your cold goes away soon! Chicken Skin... yep!! The back of my arms... I've always been so jealous at people in summer with slick smooth arms. I've always cringed when people touch my arms because I know its gross feeling. Totally going to try some of these ideas. I have not heard of this. My mom has really bad eczema and swears by coconut oil. I personally use coconut oil as a cure all! These are interesting treatements, though! Hang in there...I hope you're feeling better day by day. Is Keratosis Pilaris similar to Eczema? IF so, I used the Neosporin treatment for eczema and it works great. Glad to hear you are doing well! My best friend who also worked at Lush had horrible KP and swore by Ocean Salt! I don't have KP, but it gave me the smoothest skin! I do not have this ailment but I sure know the joys of finding something that works when you have some skin stuff going on! I don't have KP but I think these are great tips for dry skin or rough patches in general! I do get rough patches. You said If you get cystic acne to talk to a dr before taking prenatals, why is that? Just wondering....I have heard great things about that Lush scrub that you shared and am thinking about trying it. I hope you are feeling better. I have KP, too! So frustrating. I have it on my arms and on my thighs. I eventually got a cream from my dermatologist that seems to be helping. Good luck!! I don't have this problem, but it sounds like a wonderful resource for people who do! you always have great tips. I'm glad to read your hanging in there. My best friend suffers from this! Ohh, thank you so much for this post, Elle, I'll be emailing this to her! This post is just in time! The weather has really warmed up in DFW. I'm pretty lucky in that I have just a little bit of kp, so it's not too bad. I would like to clear up what I have, though. These are such great tips! Thank you for sharing! I don't have KP but after this Winter my skin has taken a beaten so the exfoliates are needed. Keeping you in my thoughts. My mom used to get the Italian washcloths when we lived in Korea. We never knew they were called Italian washcloths! I don't have KP, but I love them for exfoliating! I watched the vid but honestly have never heard of any of it before. You did give some great tips though that could translate for other skin inflammations. PS really glad to hear you're hanging in there. Low key weekends are sometimes the best! didn't know about this condition, hope everything is ok with you. I totally needed this post! My daughter's skin is so dry from being in the pool so much and she has this on her arms. I love CereVe products and those Italian washcloths sound great! I have these red bumps too, they seem to be worse in the winter. Have you ever heard of Paula's Choice? They recently came out with KP Wipes that may help (haven't tried them myself, I just ignore my bumps :-)). Ahh! Elle, my kp is back! It was gone for like a year but it has creeped back on my arms, blah! I knew I had to come back and check out your posts on this....I am going to try a sugar scrub and some thick lotion and maybe start taking prenatals again- those helped last time!